So, …. are we all forced into silence by the creationists ? The advice is not to use a term because it illuminates that there are new ways of thinking about an existing (and accepted) theory. We cannot speak in fear of being misinterpreted ? Such a coward attitude ! …the dominant political concern was a fear of attack from fundamentalists. As Gould discovered, creationists seize on any hint of splits in evolutionary theory or dissatisfaction with Darwinism. In the past couple of decades, everyone has become keenly aware of this, regardless of their satisfaction or otherwise with the modern synthesis. “You always feel like you’re trying to cover your rear,” says Love. “If you criticize, it’s like handing ammunition to these folks. Well, discussing in this cover-up manner will in my opinion, provide even stronger ammunition. Science is not about keeping your silence, quite the contrary. ” So don’t criticize in a grandstanding way, says Coyne: “People shouldn’t suppress their differences to placate creationists, but to suggest that neo-Darwinism has reached some kind of crisis point plays into creationists’ hands,” he says. The glue holding a regime of terror together, are terrorized people. But, why be afraid, – facts are on our side. We are free to safely discuss the implications of these facts. There is no danger in this. So please, please, stop holding your arguments back. It does not serve the cause of solidifying evolution as a fundamental force in biology. Speaking clearly on all scientific views of evolution theory on the other hand will, and holding back only makes things worse. Unlike most scientists and, in particular, European scientists, my family is from the American Midwest and are evangelical Christians. Many of my teachers were Christians, too. My parents are well educated but also believe in creationism. So, I have plenty experience with this debate. To me, evolution is a no brainer. Fact 1: Everybody dies, yet life persists. I think nearly everyone will agree with that no matter what they believe. OK, so how does life persist despite the fact that everybody dies? The answer is reproduction and I also think that nearly everyone will agree with that, no matter what they believe. Fact 2: Every environment changes. I think everyone will agree with that too, matter what they believe. Indeed, any environment harboring life forms must change, simply because of their existence. 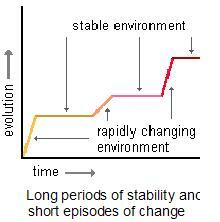 OK, so how does life persist in a changed environment? To me, this is possible only through natural selection for relatively small environmental changes and Darwinian evolution for relatively large environmental changes. In the long run, life persists only by evolution. It’s truly a wonderful thing.